If you are coming by car, the best place to park is The Star Car Park. Take the lifts from the Car Park and walk through the cafe court to the ramp entrance outside the Sydney Lyric. This trip will take you about 5 minutes and bring you to our Stalls and Box Office foyer. An alternative is to drop your passengers in front at The Star’s Harbourside entrance where there is a lay-by area on Pirrama Road. Patrons can then take the escalators or lift up one level and walk for 1 minute to the Sydney Lyric entrance. There is an option to use the ramp for stair less entry. Please note, we do not recommend coming in via Pyrmont Street. Wheelchair seating is located in Row P and Q of the Stalls. Patrons who wish to remain in a wheelchair can be seated in Row P. Patrons transferring from a wheelchair can be seated in Stalls Row Q. There are ramps allowing access to these seats. The Sydney Lyric welcomes patrons with disability. If your question is not answered here please call us on (02) 9509 3600 or email access@foundationtheatres.com.au. If you have trouble negotiating stairs, please book your seats in the Stalls. Ramp access is available via Doors 13 & 18 (Stalls Row P and Q). There are shallow stairs to navigate if you book tickets outside of these rows, however the closer you are to these rows, the less stairs will be encountered. See our Stalls seating map here. Wheelchair seating is located in Row P of the Stalls. These seats can be booked by calling (02) 9509 3600 Monday to Friday 9am – 5pm. If you would like to arrange a call back email us by clicking here and making sure to fill out your access requirements. Companion Card holders can book by calling (02) 9509 3600 Monday to Friday 9am – 5pm. Pickup and drop off points are located on Pirrama Road. Lifts and escalators provide access to the breezeway and theatre entry. Disabled parking spaces are reserved close to the entrance lobbies on every level of The Star car park. Please note, there are charges for this car park. Hearing Loop is accessible in some Stalls seats. Please see map for more information and turn your hearing aid to T for reception. Disabled toilets are located in both the Stalls and Dress Circle foyers. Accredited service dogs are allowed to enter the theatre upon presentation of accreditation proof. Service dogs must remain on the floor at all times. 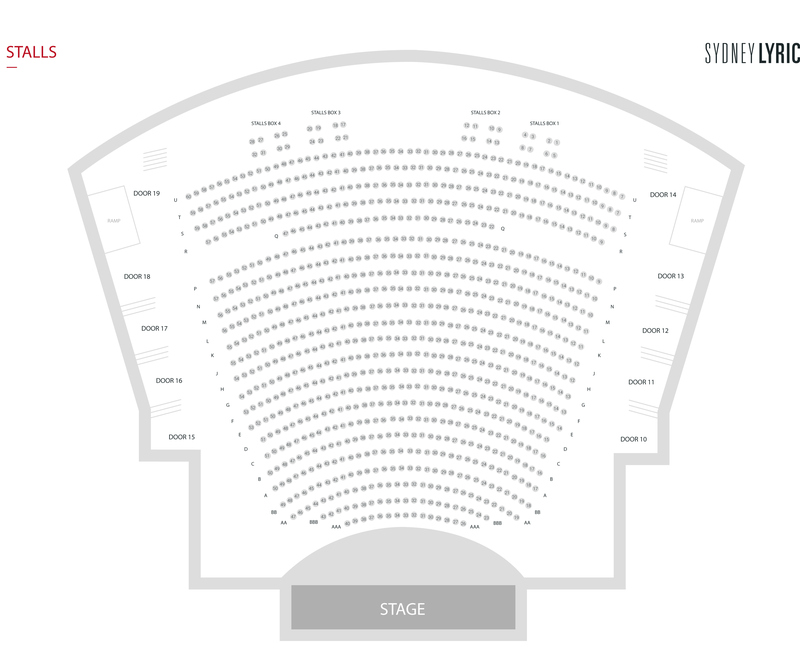 Stalls has a gradual incline right to the back of the auditorium, patrons will be at eye level with the Stage at around Row F-G. View the Sydney Lyric seating plan.